The results section is where you present the data you produced from your experiments. Your raw data will normally be summarised in tables and figures. The tables and figures are supported by text that highlights the important trends shown in the data. 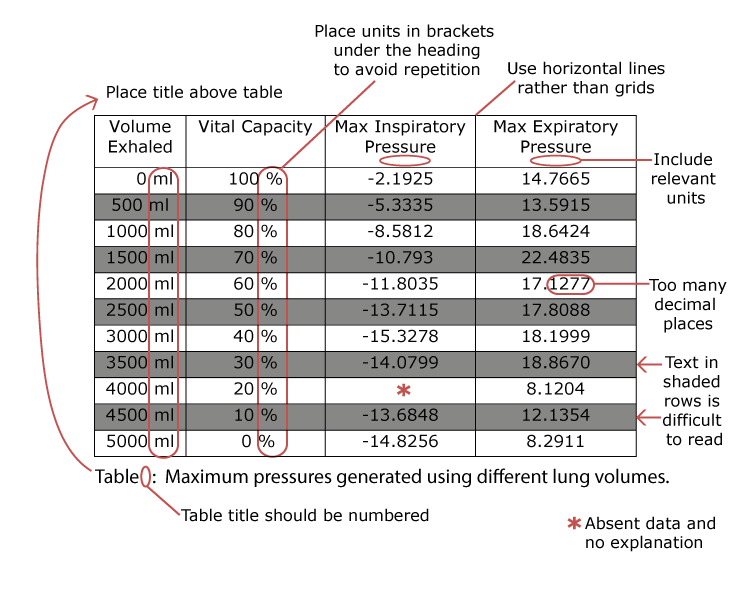 Each table and figure should have corresponding text. 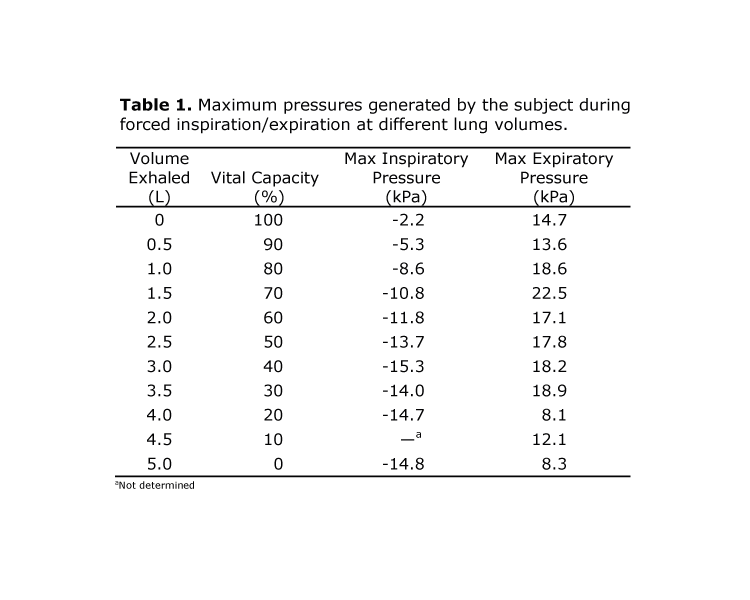 Click on the bars below to see examples of figures, tables and text. Move the slider to see how to improve this figure. Move the slider to see why this is good figure. Move the slider across the table to reveal comments about how to improve this table. Move the slider to see how the orginal table has been improved. 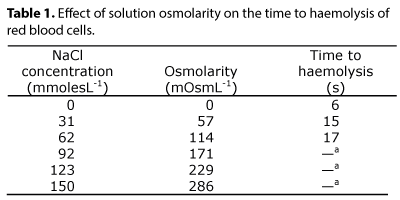 Table 1 shows NaCl concentration, osmolarity and time to haemolysis. At 0 time to haemolysis is 6, at 57 time to haemolysis is 15 and at 114 time to haemolysis is 17. Then 171, 229 and 286 no haemolysis was detected. These results suggest that the diffusion of water is dependent on the size of the concentration difference between the two solutions (Berne et al., 2004). Times required for haemolysis are approximations because of software limitations. Reading the table rather than highlighting important trends. Lack of units makes numbers meaningless. Place the table reference in brackets at the end of the sentence (Table 1). The last two sentences ("These results suggest.....") are interpreting the results and discussing limitations of the experiment. These sentences would be better placed in the discussion section. Present tense is acceptable for things that are currently true e.g. 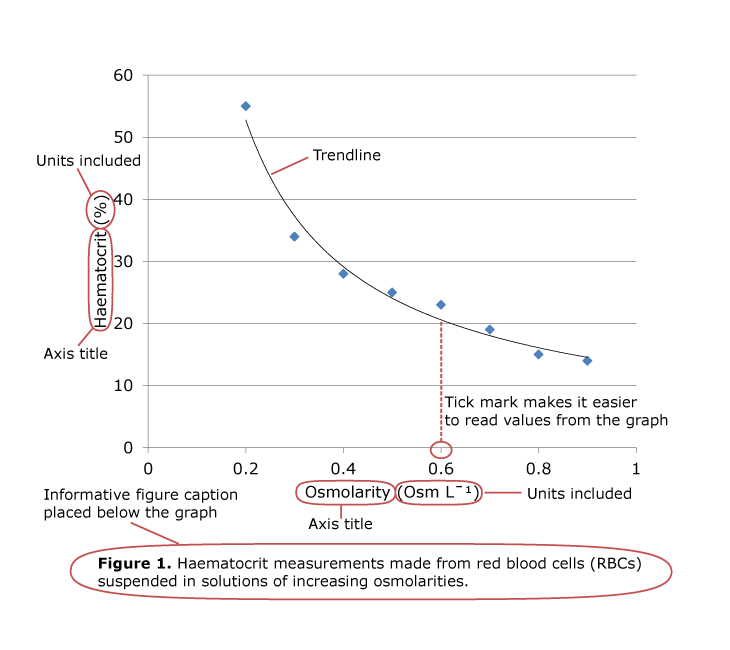 "Table 1 shows..."
Red blood cells lyse faster in solutions of low osmolarity (Table 1). 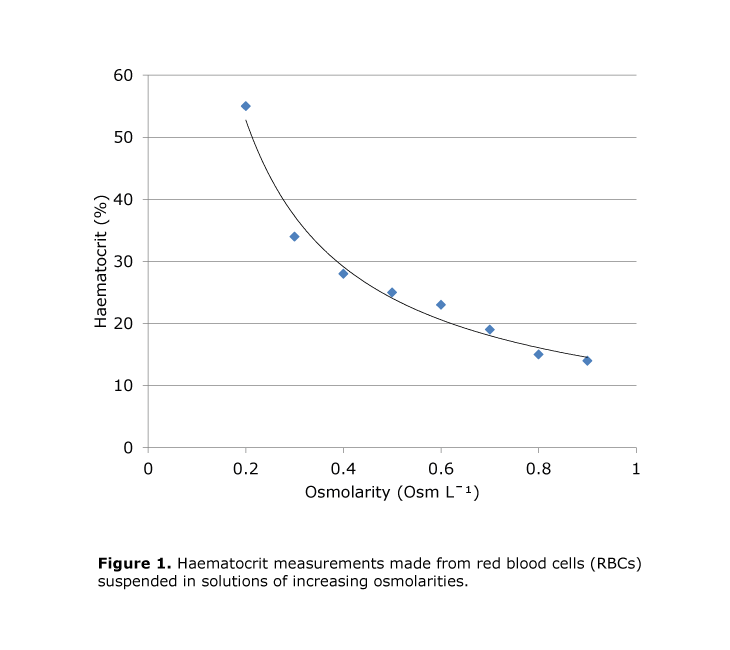 Haemolysis occured in 6 seconds in distilled water and took almost three times longer when the osmolarity was increased to 114 mOsmL—1.Haemolysis was unobservable at osmolarities of 171 mOsmL—1 and above. Important trends seen in the table are highlighted in the text. Trends are backed up by specific numbers. No interpretation of data since this will be done in the discussion section. Written in the past tense because the events described have already occurred. You are marking a series of undergraduate lab reports. 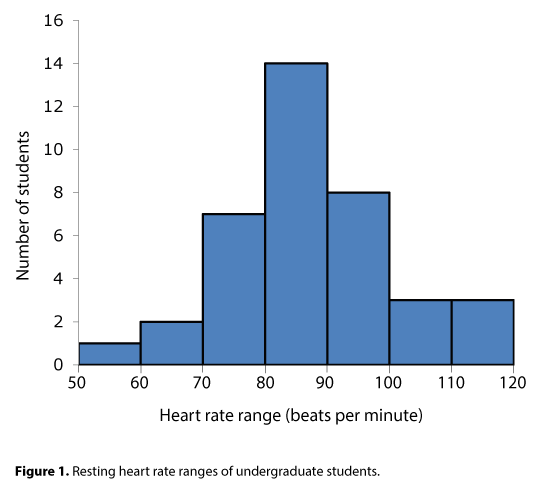 Below is a graph of the resting heart rates of a group of students. 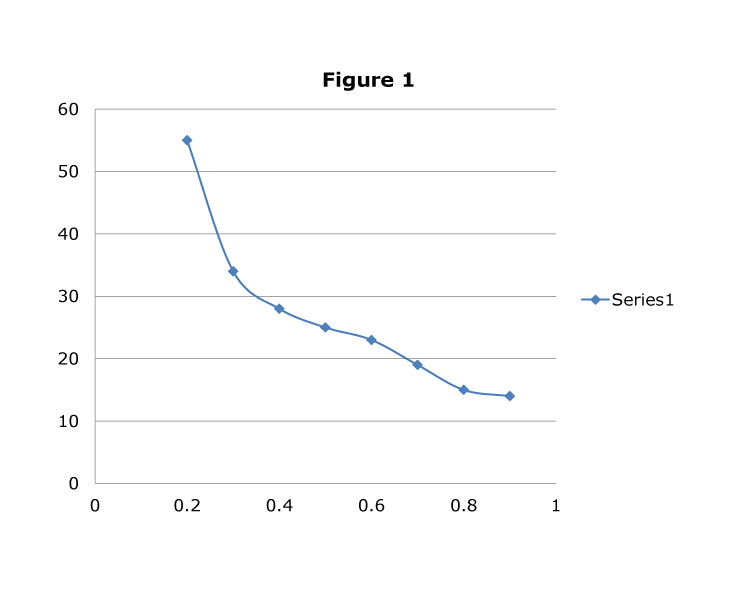 This graph appears in the results section of one of the reports you are marking. Give this student some feedback to help them improve their data presentation. 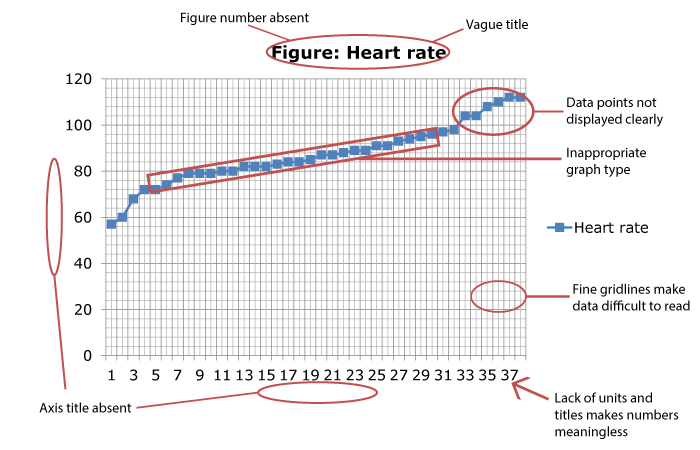 Presenting the data as a histogram would show the ranges of the heart rate and the spread of the data. 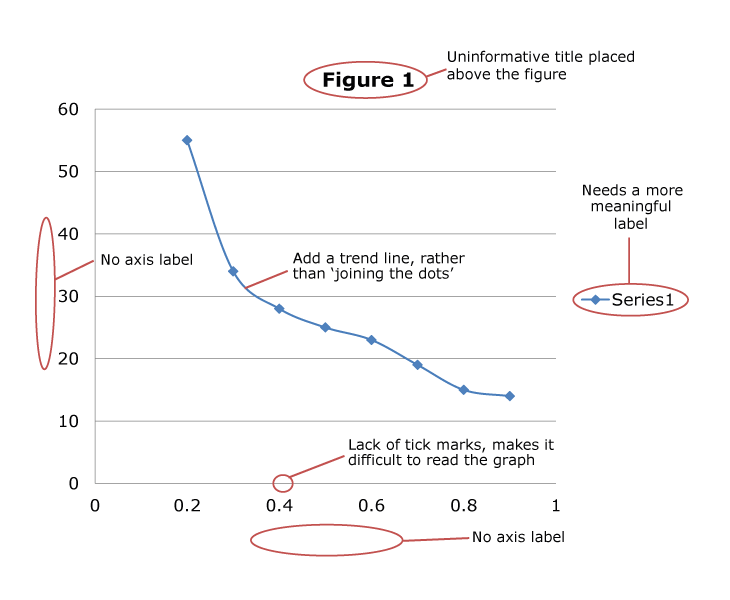 A line graph is more appropriate for showing relationships between two variables or trends. The title needs more information. 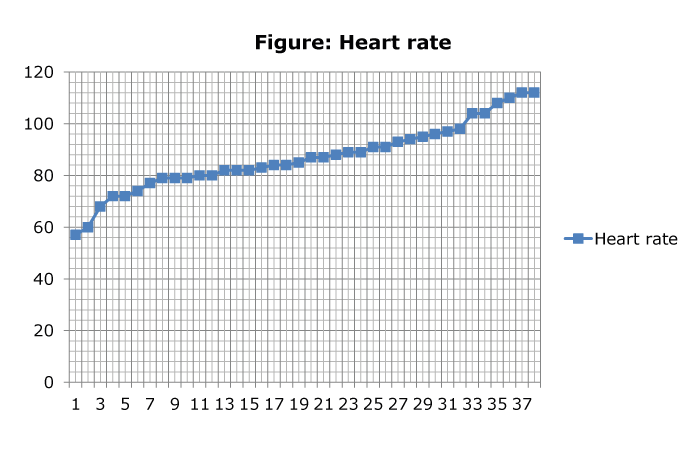 For example whose heart rates were measured and under what conditions (e.g. resting)? There is no figure number. 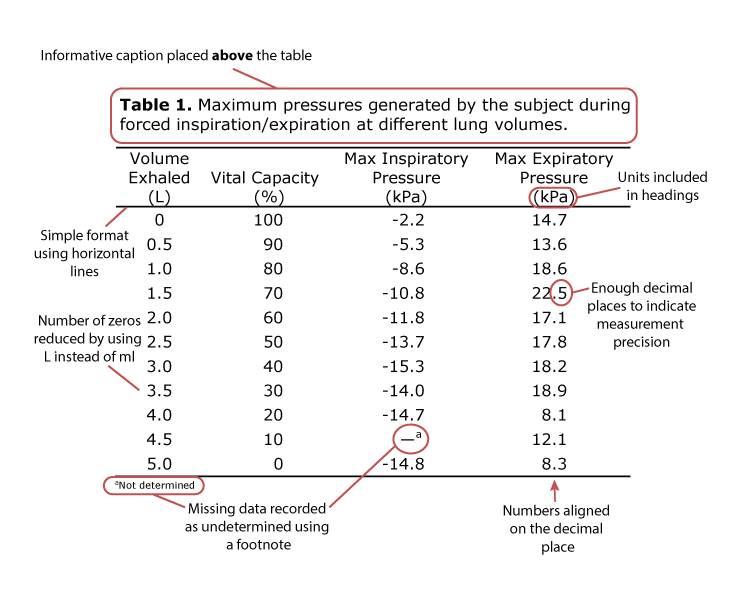 Numbering of figures and tables helps link the appropriate text to the correct figure. 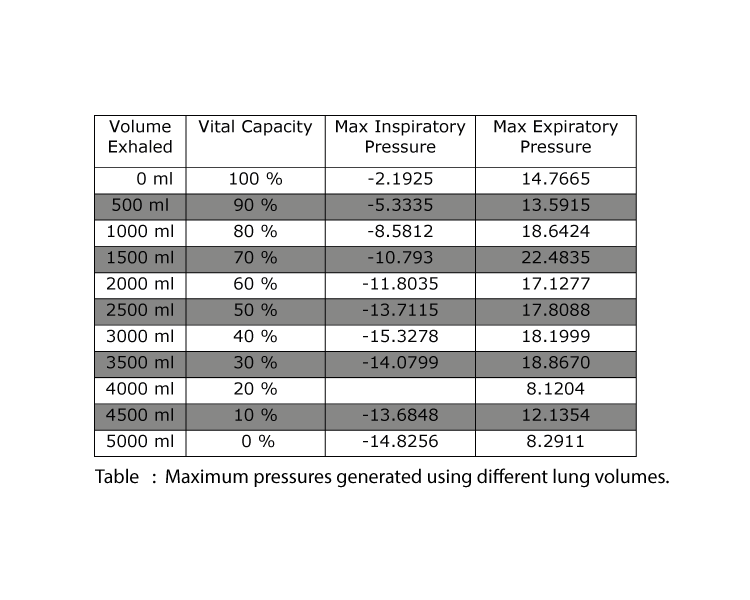 There are no units associated with the numbers making the data meaningless. The large, blue squares and fine gridlines makes the graph difficult to read.